312 pages | 15 B/W Illus. 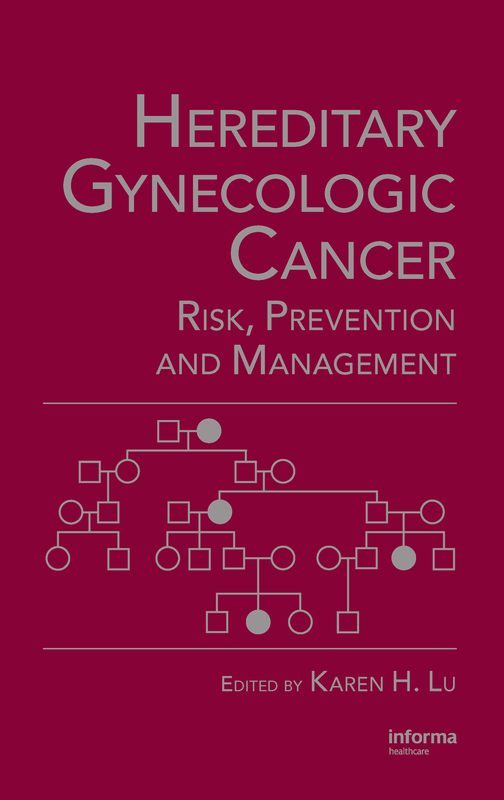 Hereditary Gynecologic Cancer: Risk, Prevention and Management fills the need that exists for a book addressing highly relevant clinical issues associated with the new field of hereditary gynecologic cancers. Written with the clinician in mind, the authors will cover a broad range of topics, beginning with an overview discussing clinical relevance of hereditary ovarian and hereditary endometrial cancers. Succeeding sections will provide in-depth analyses of Hereditary Breast Ovarian Cancer Syndrome, Lynch Syndrome, and other syndromes with gynecologic cancer components, and genetic risk assessment. Clinical relevance of Hereditary Ovarian Cancer. Clinical relevance of Hereditary Endometrial Cancer. Molecular Genetics and Cancer Risks in BRCA1/2. Pathology of BRCA-associated ovarian cancers, including occult cancers. Ovarian cancer screening. Ovarian cancer prevention. Ovarian cancer risk reducing surgery. Breast Cancer Screening and Prevention. Management of mutation negative patients. Therapy and prognosis of BRCA associated ovarian cancer. Molecular Genetics and Cancer Risks in Lynch Syndrome. Pathology of Lynch-associated endometrial and ovarian cancers and use of molecular diagnostics. Endometrial and ovarian cancer screening and prevention. Colon Cancer and Other Lynch Cancers Screening and Prevention. Endometrial and ovarian cancer risk reducing surgery. Li-Fraumini Syndrome. Ovarian Cancer and BRCA1 and BRCA2. Endometrial Cancer and Lynch Syndrome. Genetic Discrimination. Psychologic impact of genetic testing. KAREN H. LU is Professor of Gynecologic Oncology, The University of Texas M.D. Anderson Cancer Center, Houston, Texas, USA. Dr. Lu received her M.D. from Yale University School of Medicine, New Haven, Connecticut, USA and her medical training from Brigham and Women’s Hospital and Massachusetts General Hospital, Boston, Massachusetts, USA. She is the Co-Director of the Clinical Cancer Genetics Program and Director of the Ovarian Cancer Screening Clinic and Uterine Cancer Research Program at MD Anderson Cancer Center, Houston, Texas, USA. Dr. Lu is a recognized scholar of hereditary gynecologic cancers and has published extensively on BRCA-associated ovarian cancer and Lynch syndrome-associated endometrial cancer.